Far be it for me to question The Don. I mean who am I to dare challenge Vito Corleone? And who I am to infuse pop culture into a given marketing and advertising topic? You know by now I live to take pop culture and overlay into our world as witnessed by one of my most recent articles – an end-of-the-year piece which saw some of the best and brightest minds in marketing and advertising come together to share their thoughts for 2014. Of course there was a twist as I asked the players involved to not only include their predictions for 2014, but to overlay a pop culture reference that best fit and aptly described their insights. The reason I chose this particular line is I think marketers and advertisers the world over need to go back to the beginning – literally and figuratively. The world of course is a highly digitized place and with all the spectacular and life-changing technological advances comes it with an undeniable sense of desensitization. Perhaps it was only natural that as technology progressed so too did the distance between people; between those on the selling side of the cash register and those waiting in line. I read a story not long ago but the practice some retailers are taking which in essence says they will not wait on a customer who is on his/her phone as they approach the register. I love it. I love it because this goes both way kids. Yes we are all marketers and advertisers but we are also consumers. Collectively we need to go back to the beginning; to a time where people matter most. 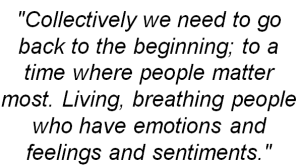 Living, breathing people who have emotions and feelings and sentiments. I am by no means advocating not using all digital channels available to us. Of course not. I am merely saying the customer has to be put first, front and center. We must collectively shrink that line of desensitization once and for all. 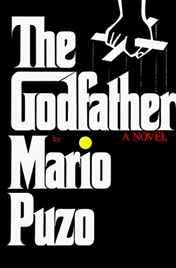 Do you see The Godfather connection yet? Sorry Michael and with all due respect, but when it comes to the world of marketing and advertising in the year 2014 (and beyond) it is both personal AND business. At least it should be for the two go hand in hand. The other day my friend Daniel Newman wrote a piece entitled P2P Shifts The B2B Customer Experience Landscape. As usual it was brilliantly written and provided excellent insight and advice to all who read it. While Daniel was referring to the B2B marketing world only, it is quite evident that his advice is best heeded by those on the B2C marketing side, too. Oh in case you didn’t know or weren’t sure, the P2P refers to either peer-to-peer or person-to-person. I prefer the latter because it’s well, more personable, pun intended. He of course is dead on for without a great experience it will not matter how great or how inexpensive your product is – people will not come back and loyalty will be out the window. And when you consider the fact that it costs 6 times more to attract a new customer than it does to keep an old one, I would say customer loyalty is pretty darn important, wouldn’t you? The called out quote is part of what I wrote above and the reason I am highlighting it is because of what is at the heart of every great customer experience, but people. Nothing will ever replace the interaction between two human beings. But if the experience is so important why when are so many businesses not paying more attention to it? 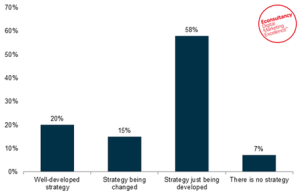 According to Econsultancy just 20% of companies have a well developed customer experience strategy as you can see from this chart. The cynic in me, however, would say that the 58% who claim to be developing a customer experience strategy could have no set launch date in place and it’s more wishful thinking than reality. But far be it for me to be cynical. However there is no denying the importance of delivering the most optimal experience for consumers each time, every time. While it is from 2011 and the numbers/percentages surely have changed, the key message absolutely remains the same and that is the retention of existing customers via the aforementioned optimal experience is paramount to the overall success of a given company/brand. Only 4% of customers trust advertising the most as a source for product or service information. 40% of consumers began shopping with a competitor because they heard about that company’s reputation for good customer service. 85% of consumers would pay up to 25% more for better customer service. 82% have stopped doing business with a company due to poor customer service. Look, there is no magic wand, no secret sauce here boys and girls. To be successful in ANY business, be it B2B or B2C or some unknown, undiscovered form I am not yet aware of, you have to treat your customers the right way; you have to treat them the way you want to be treated. But that’s why I say we need to go back to the beginning. There simply has to be a personal side to your business. The experiences your customers and prospects go through when dealing with your company and brand cannot be just about business. People will not stand for it. They want a personal interaction and they want interaction to be sincere and respectful. This article originally was featured on Forbes and can be found here. The article has been shared with permission from the author.